[toc]Heat stroke can be defined as a boost in the body heat or hyperthermia which exceeds 105.1°F or 40.6°C with sudden stoppage of sweating as well as rational confusion. The heat stroke is connected with higher morbidity as well as death if not taken care of quickly. Actually the heat stroke alone is not risky. However the failure of recognizing early symptoms is likely to increase the fatal outcome.The heat stroke symptoms may develop within a few days in susceptible people like elderly as well as those having long-term problems related to health, predominantly in the warm weather. The heat stroke symptoms increase more rapidly when related with physical activities. This kind of heat stroke is mentioned as exertion heatstroke. This generally affects younger people. Heat stroke symptoms include. 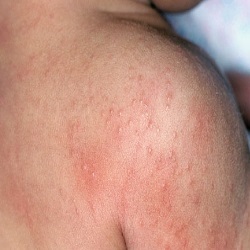 Also known as prickly heat, it is the skin irritation caused by extreme sweating. This can happen for people of any age; however it is most commonly witnessed among young children. This looks like red clusters in the form of small blisters or pimples. Heat rash due to a heat stroke mostly appears in the neck, upper chest, within the groin, under the breasts or in elbow creases. The temperature of around 40°C/104°F or more is generally a main indication of heat stroke, even though it may sometimes be diagnosed with lower temperatures as well. However, this is not the only indication. Some people may reach these temperatures during physical exercises without developing a heat stroke. In case your body is not able to generate more sweat, then it’s a main warning sign confirming that it has turned into over-heated as well as dehydrated. You may be sweating profusely which suddenly stops. Cramps consist of muscle spasms or pains, generally in the arms, abdomen and legs. They can take place after a tiring activity in the hot environment, while the body gets exhausted of water and salt. They can also be the symptom for heat exhaustion. Heat-associated fainting and dizziness results from decreased blood flow towards the brain. When the body becomes extremely hot, it results in an increased blood flow towards the skin as well as blood pooling in legs. This causes a sudden drop of blood pressure leading to light-headedness and in some cases, fainting as well. The intense heat which causes heatstroke affects the nervous system that may lead to other symptoms including mental confusions, lack of co-ordination, fits or seizures, anxiety or restlessness, problems in understanding as well as speaking with others, hallucinations, loss of perception, red, hot, and dry skin, rapid pulse, headache, strange behavior, rapid or shallow breathing, probable loss of perception, paleness, sweating, speedy heart rate,nausea and vomiting. Heat stress is very serious health condition which may convert into heat stroke. Its symptoms vary along with the kind of heat-associated illness. This happens when too much sweating in hot environment decreases blood volume. Heat stroke symptoms must be recognized on time and treated appropriately to avoid a fatal outcome.